The newspapers were right: the sun was general, all over Norfolk. It was falling on every part of the wide central plain, on the rolling hills, falling softly upon the Broads, and, farther eastward, softly falling onto the dark, mutinous North Sea waves. It was falling, too, upon every part of the lonely churchyard of Antingham, on the crooked crosses and headstones, on the spears of the little gate, on the barren thorns, like the descent of their last end, upon all the Living and the Dead. Well, that's what James Joyce might have reflected if he'd been there. In this case, my son Jimmy and I were the Living. It was one of those stunning days in July 2006, probably the best month of continuous fine weather there'd ever been in Jimmy's lifetime, and we'd hauled our bikes up on the train from Ipswich, to get off at Gunton to go pedalling along these quiet, narrow lanes. By the time we got to Antingham, the sun was beginning to disappear behind its haze, and the graveyard is unfortunately beside the busy North Walsham to Cromer road. But although it may be neater and trimmer than the churchyard where Michael Furey lay in Joyce's Dubliners, it was still a lovely place to be. 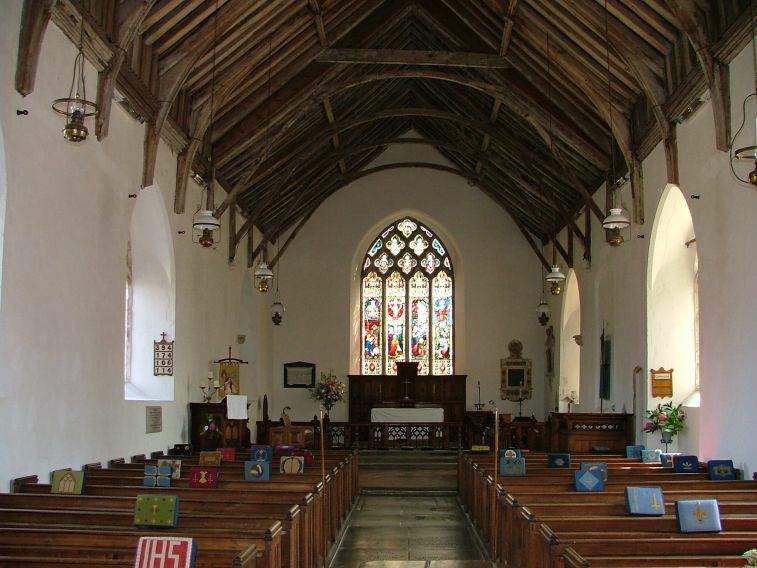 And, it must be said, the church is opening and welcoming, as they all are in this part of Norfolk, which is always a pleasure to be in. The Trunch Team Ministy churches are among the friendliest in England; they understand how to offer hospitality to pilgrims and strangers, and their reward will be in heaven. 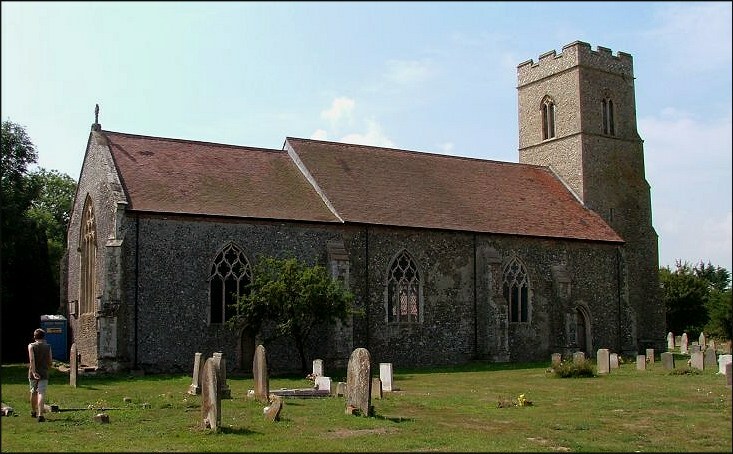 Antingham churchyard has two churches, St Margaret and St Mary. St Margaret is now a ruin, but still a spectacular sight, sitting parallel to St Mary across the graveyard. I thought of Dorian Gray for a moment, as if St Margaret was a reflection in an attic glass of St Mary, revealing the true nature of her age. But I could not sustain this, because St Mary is too lovely for such an idea. 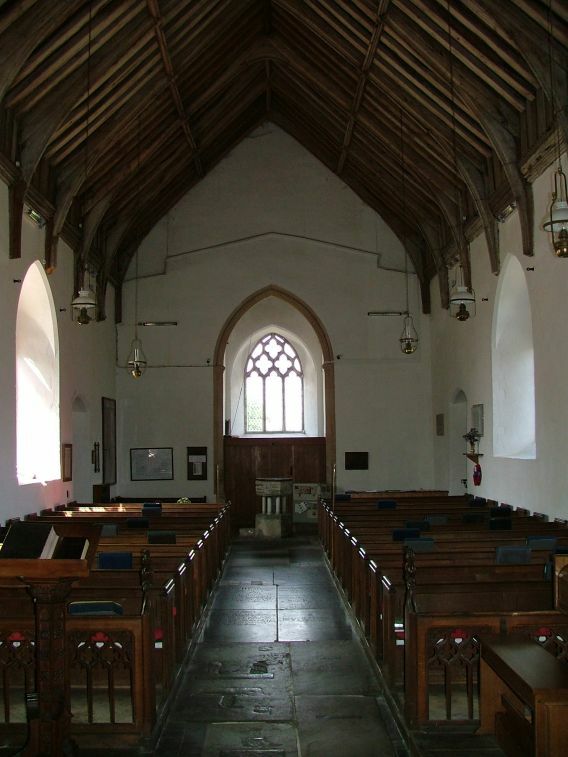 In fact, by the end of the seventeenth century they were both in a parlous state, and the decision seems to have been taken to demolish parts of St Margaret to mend St Mary. 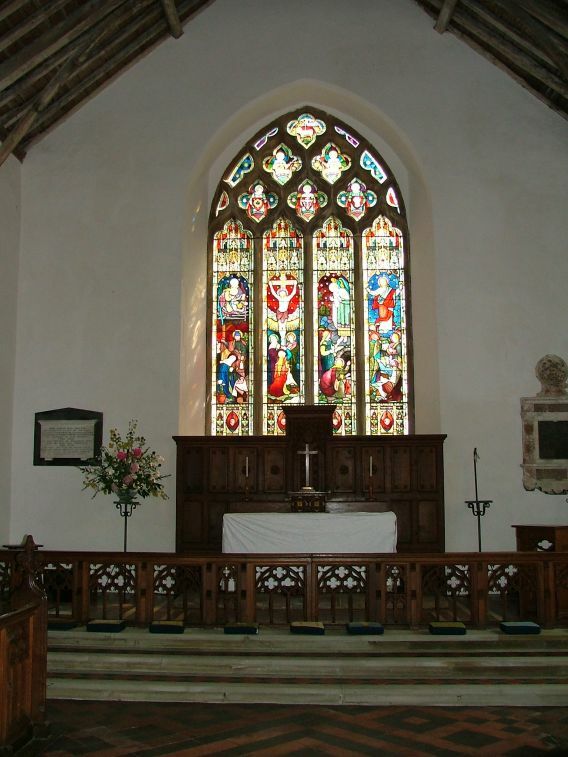 However, this does not disguise the fact that St Mary is a church of the Decorated period, and was probably complete before the intervention of the Black Death. 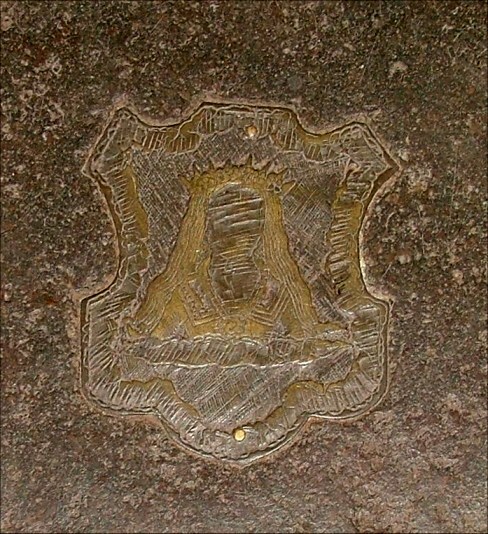 Its current shipshape state owes a lot to the major restoration of 1865. I've not come across a record of who the architect was, but he seems to have been a person of taste, because windows were commissioned from the rising firm of Morris, Marshall, Faulkner & co. 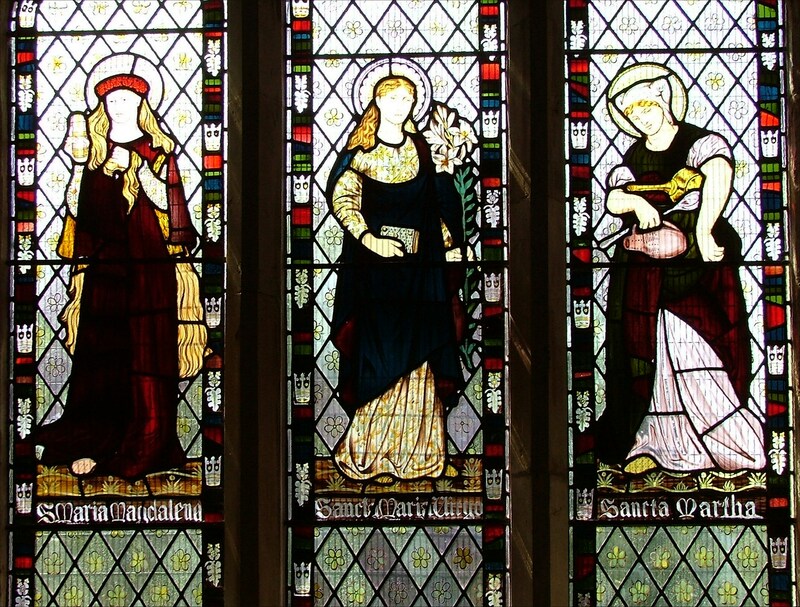 The best of these depicts the Blessed Virgin flanked by St Mary Magdalene and St Martha. 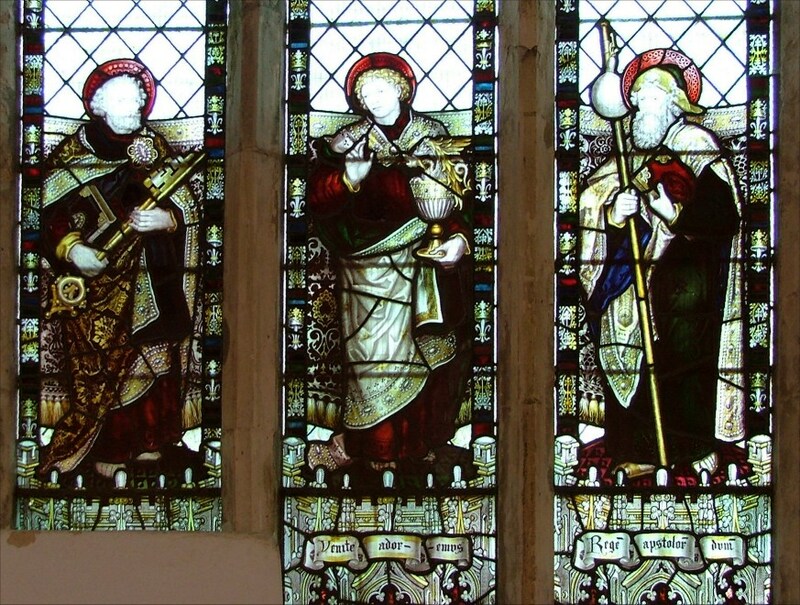 The central figure is typical Burne-Jones work, and the guide suggests that the cartoons for the other two figures are by William Morris himself (for St Mary Magdalene) and Dante Gabriel Rossetti (St Martha). Martha is shown holding a clumsy collection of pots and pans. The Blessed Virgin is shown at the Annunciation, holding her prayerbook and lilies. Was the cartoon originally paired with one of the Archangel Gabriel? 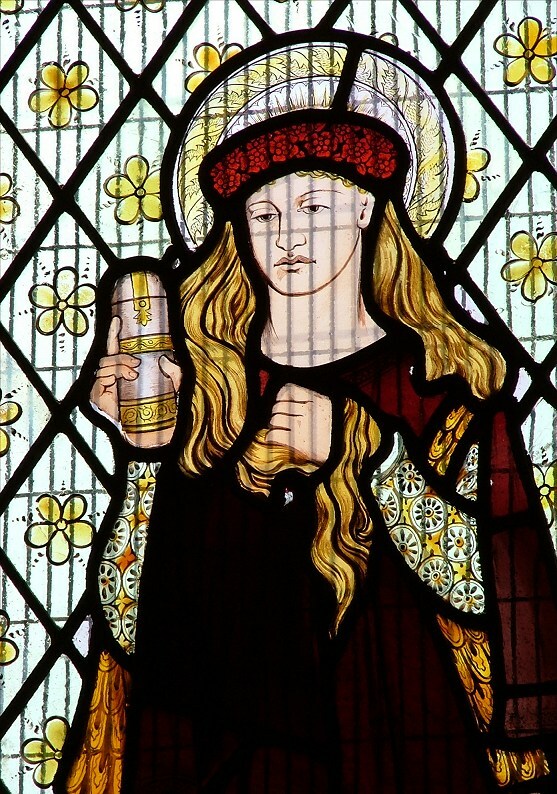 Mary Magdalene looks as if she is holding a can of Carlsberg Special Brew, but I'm sure that can't be right. 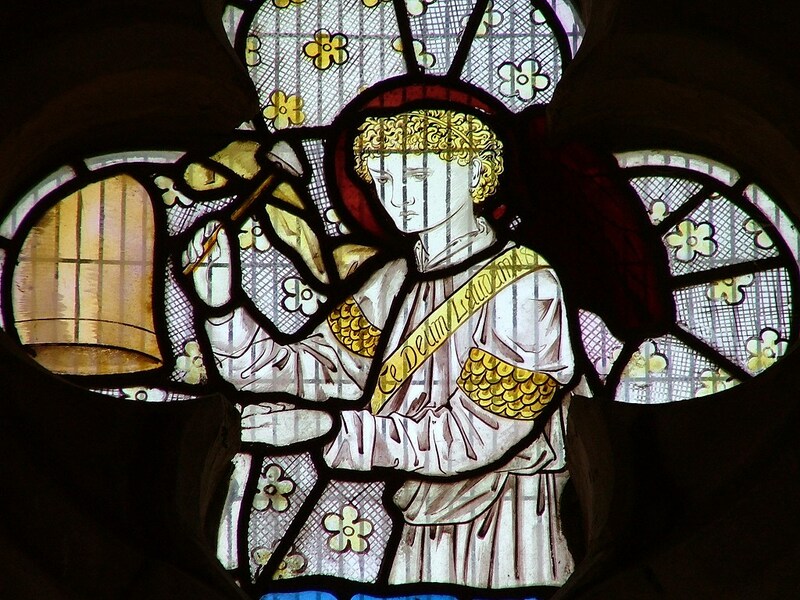 The Magdalene looks like Morris's work, although you can't help thinking that Martha might have been a more appropriate subject for Morris, being as sober and industrious as he was. 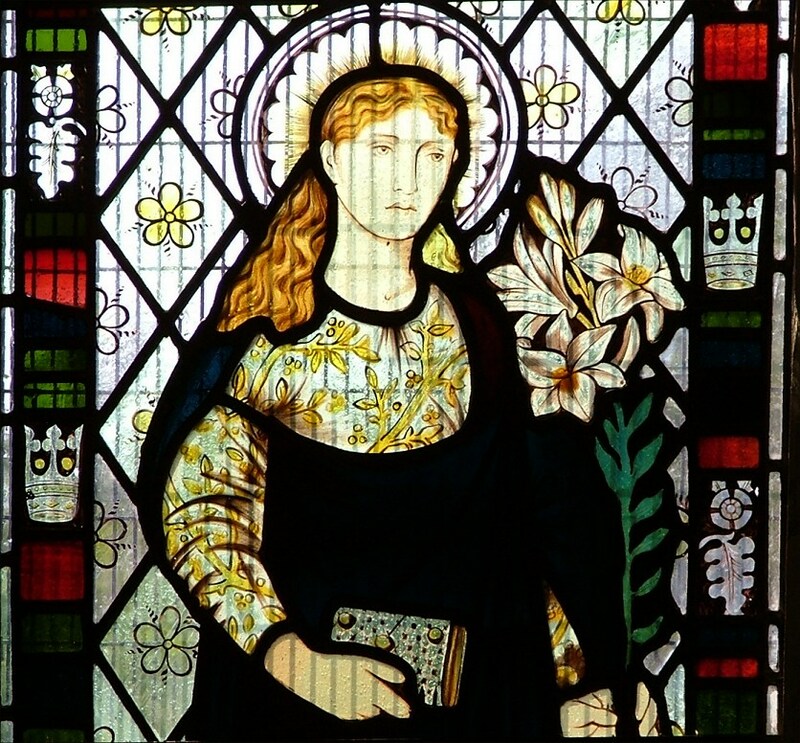 And perhaps Mary Magdalene might have been more appropriate for Rossetti; after all, he was a sensualist, and knew a thing or two about girls. Whatever, Rossetti's work is rare in East Anglia, and this is worth a visit. 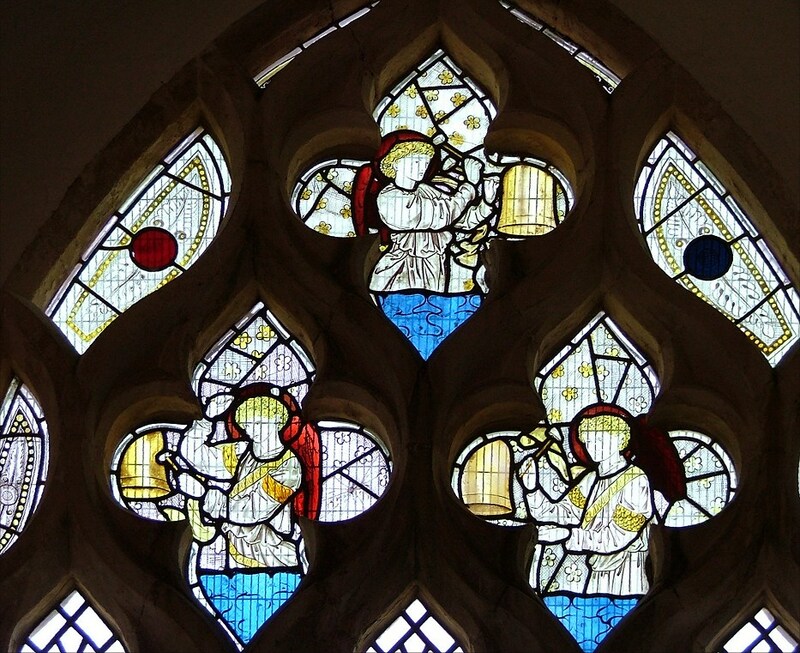 Burne Jones was responsible for the other glass, across the nave, which depicts three angels ringing bells. Supposedly, it was originally designed for St Michael in Brighton. 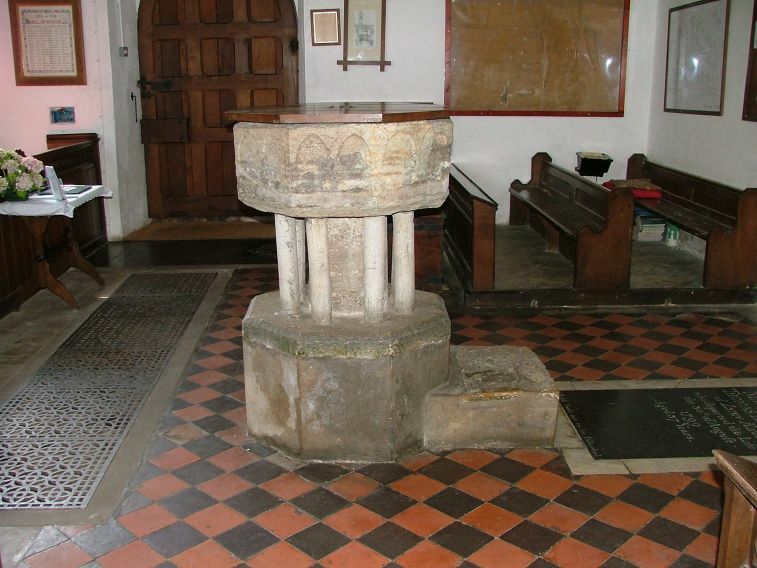 The font is one of those off-the-peg Purbeck marble jobs of the 13th century, which many churches seem to have around here, and apart from that the church is essentially 19th century in character. 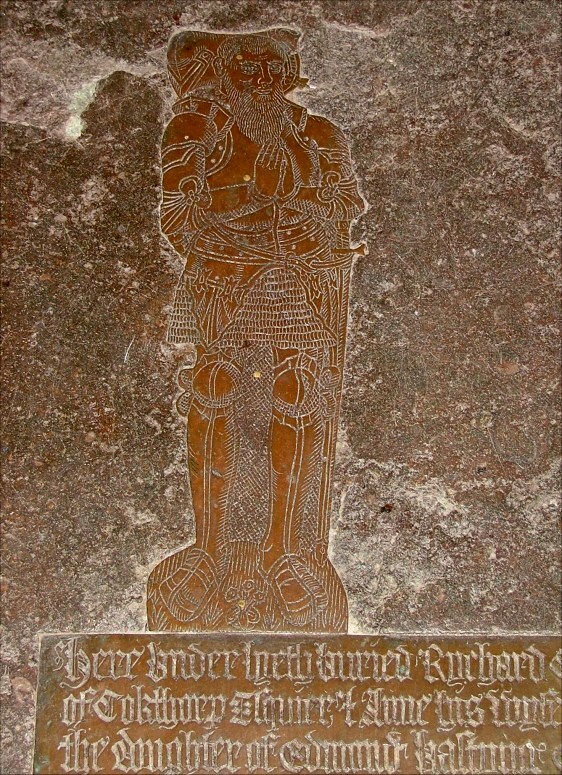 The great exception is an intriguing memorial brass up in the chancel. It is to Richard and Anne Calthorpe. Her figure has been lost, but the piece is fascinating for three reasons. Firstly, because the date is 1554, and the inscription records that this was in the first and second years of King Phillip and Queen Mary. Secondly, there is a head of Christ the Man of Sorrows as part of the brass, which has been vandalised, probably by puritan reformers. 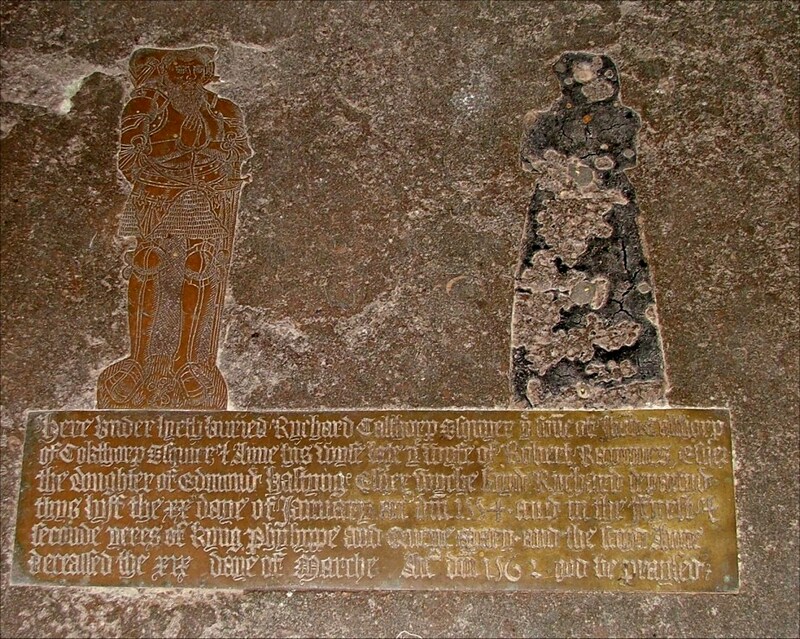 And lastly, the brass beneath the inscription shows their children, no less than nineteen of them. The poor woman must have died of exhaustion.